Add text1.rtf, pict1.jpg or gif or video1.mpg wmv or avi, followed by text2 etc in a separate module, without the contents.rtf and they will be played in a sequence rather than on demand link the menu displays do. The eLibrary contains a presentation screen format that will allow you to add a sequence of screens containing any combination of the following frame layouts. Text only. May cover the full page and have a soundtrack. Picture only. May cover the full page and have a soundtrack. Video clip only. May cover the full page and have a soundtrack or use the video soundtrack. Picture and half page text. May also have a soundtrack. Please note that larger pictures and blank lines of text may be used to give the effect of a full-page picture with a titles. Video clip with half a page of text. May also contain a soundtrack or the use the videos soundtrack. If you want a text document to appear in section 1 of the program then simply save the particular text file into module1 directory as text1.rtf. If you then want to display some text with a picture then simply add a text file called text2.rtf and a picture file called pict2. Look at our example to see how this works. The sequence is controlled by the file numbers e.g. text1.rtf, pict2.jpg, text3.rtf. Pictures can be in .jpg format or .gif format and must be called pictN.jpg or pictN.gif. Videos must be in .avi or .mpg formats and are called video1.avi or video2.mpg etc. Sound can be added to any section by adding .wav files called talk1.wav talk2.wav etc. You can also use .mp3 or .wma sound files although these will only work on computers with the relevant drivers installed. The sequence must always start with 1 although it can be any media type. There must be no break in the number sequence. 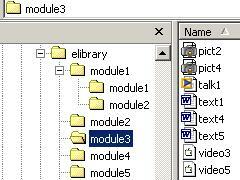 When no further file names are found the program will return to the menu list. The audio visual presentation frame allows you to step through a range of different video clips where the user can stop/ start and replay the video clip as they require. Video clips are saved in the relevant directories with the names video1.avi etc. where the 1 coincides with the step at which you wish to show the video. A separate soundtrack can be played as long as the video does not have a soundtrack of its own. This allows you to simply use the original video sound or include some new information of your own. Although you could include a large video picture screen this may overload the resources of some computers. The video quality is often a compromise with the speed at which it will run. The following is a list of important features and some suggested settings that should provide adequate quality while still working well on most computers. The standard program plays .AVI, wmv or .mpg video files. Remember that the video drivers must already be installed on the user's PC so check with an expert about which format is the most appropriate for your needs. 25/30 frames per second are the US and European standards although 15 frames per second is usually good enough. Questions can be added to a presentation using the eLibrary editor software.